Everyone knows apples are good for you, and I've always loved the quenching sound of someone taking a bite out of the apple. But I've never been a fan of the fruit and the only times I ate it were largely due to my mom. Apples always remind me of my mom because every time I used to go to her apartment for dinner, she would always delicately cut me slices of the apple. She knew I didn't like the skin, so I would watch her finely cutting the skin, leaving behind a red swirl for me to play with like a slinky. No matter how old I became, she would force me to eat it. It's been awhile now since I've had an apple, but we found a great way to get the good apple nutrients by drinking the most delicious apple juice (pictured here). 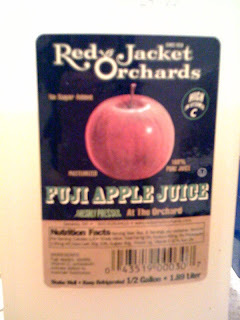 Really, this is the most delicious apple juice you'll try. By the way, this past Saturday we went to the Brooklyn Botanic Garden to see the Cherry Blossoms in full bloom and partake in the weekend's Sakuria Matsuri festival. It was an amazing day. Unfortunately, this week has already been crazy busy so we'll try to load the photos this weekend.